Google has today announced it will launch a new revamped version of Google+, providing users with the ability to customize the way the social network looks, display the content that is relevant to them and come together in a new Hangouts interface. Instead of the icons at the top, Google has provided Google+ users with a dynamic ribbon of applications on the left that can be dragged up or down to create the order that you want, hover over some of the to reveal a set of quick actions or remove them altogether. Google hopes that by providing you with these options, it will make it easier for you to adjust your preferences as you come to use it. This allows the company to roll out new features and give you to the option to choose which ones are best for you. The new conversations view will now allow “full bleed” of photos and videos that will make your media pop out when you post it to Google+. The company has also introduced a stream of what it calls conversation “cards”, which makes it easier for people to find and join discussions. If that’s not enough, a new activity drawer alerts you to notifications and highlights the community that interacts with your content. As you can see from the image below, it’s a drastic redesign, and dare we says it — it looks nice. 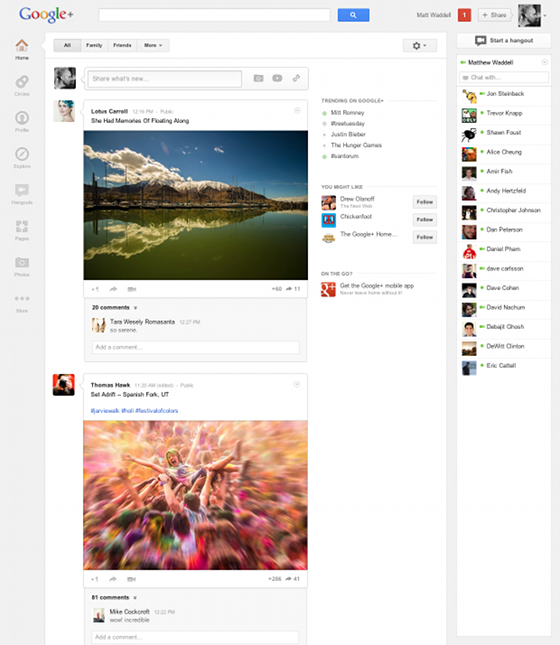 Google has also updated the design of its Hangouts on Google+, launching a dedicated Hangouts page that makes it easier for you to connect with people face-to-face. This means you will have an always-updated list of invitations from the people in your circles, quick access to every public and On Air hangout, for those times when you want to meet someone new, or watch a live broadcast and there’s also a rotating billboard of popular hangouts, pro tips and other items you don’t want to miss. Google is quick to point out that it has also added a new Explore page that shows what it interesting or what is ‘Hot’ across the social network. It has also updated profiles, providing users with the opportunity to display much bigger photos and also offers an updated Chat list that makes it easier to connect with friends in real-time. 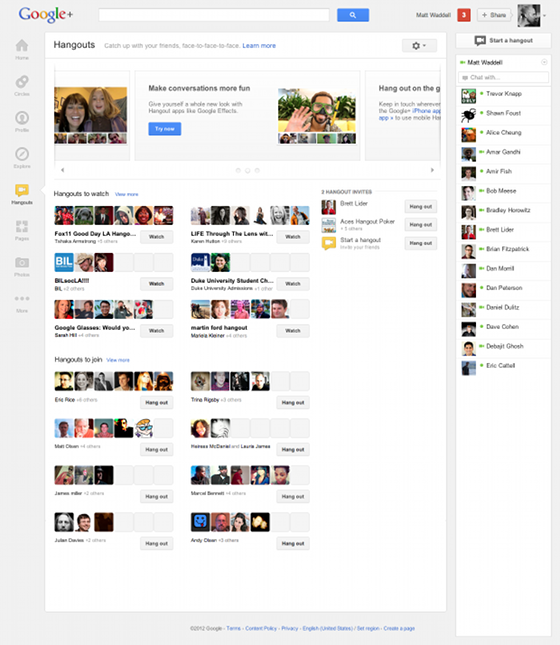 It will start with Google+ but the new look (and possibly) features may also migrate to Search, Maps, Gmail and YouTube.